Are you a Goosebumps fan? Do you think you know quite a bit about Goosebumps or R.L.Stine? 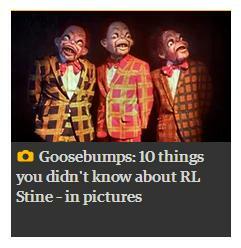 Recently The Guardian published a picture piece about Goosebumps: 10 Things You Didn't Know About R.L.Stine - in Pictures. Luckily I don't consider myself an expert on Goosebumps or R.L. Stine, because I didn't know any of this!